This is the next in a series of the original Paw Patrol dogs. This is Rubble. He is the designed to portray a construction worker. He, along with the other 5 Paw Patrol dogs, are a request from a co-worker. The others will be coming soon. Rubble was the hardest of all the Paw Patrol because his body structure is different than the others. Rubble is an English bulldog. Worsted weight yarn: Burnt pumpkin, yellow, gray, white, café latte, black, perfect pink, and carrot. Rds 8-9: sc in each sc around. (38) Change to yellow after Rd 9. Rd 29: sc in next 13 sc, sc2tog, (sc in next 2 sc, sc2tog) 3 times, sc in next 13 sc. (36) Change to white. Finish off leaving a long tail. Weave tail through sc of Rd 47, pull tightly and secure. Weave in ends. Using gray, surface chain stitches up center of front of BODY for zipper. Embroider EYES, MOUTH and EYEBROWS on PAW PATROL RUBBLE. Rds 10-13: sc in each sc around. (18) Change to burnt pumpkin after Rd 13. Finish off leaving a long tail. Using gray, embroider a hammer on one PUP PACK TOOL BOX TOP and a wrench on the other PUP PACK TOOL BOX TOP. Sew PUP PACK TOOL BOXES together stuffing before closing. Sew PUP PACK TOOL BOXES to PUP PACK. Sew PUP PACK to RUBBLE. Finish off leaving a long tail. Sew HAT SIDES to HAT TOP. Weave in ends. Finish off. Weave in ends. Sew HAT to PAW PATROL RUBBLE stuffing before closing. Weave in ends. Rd 9: Ch 1, working around outside edge of EARS, sc in each Rw, ch, or sc around with 3 sc in each corner. Finish off leaving a long tail. 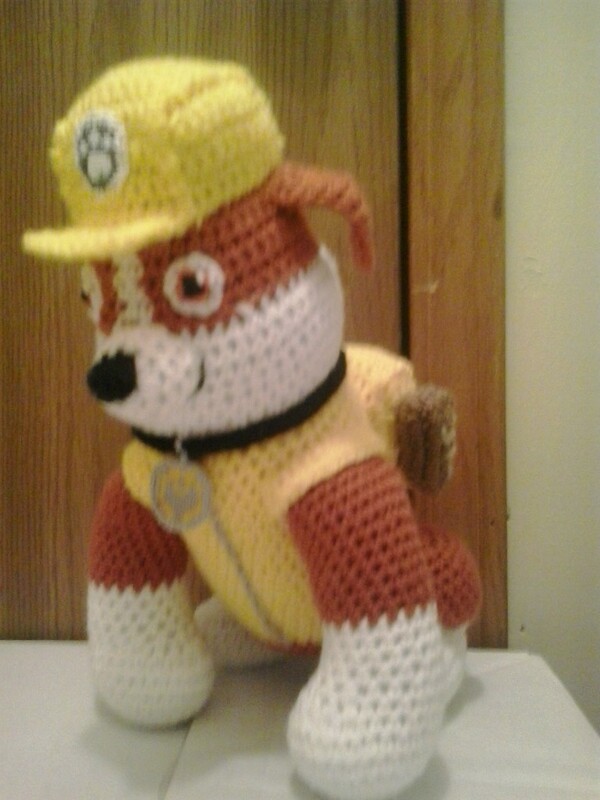 Sew EARS to head of PAW PATROL RUBBLE. Rubble and Paw Patrol are copyright Spin Master Entertainment and their respective creators.